While next-generation 5G cellular will bring faster downloads for consumers, the new networking technology is poised to bring big benefits to business users enabling new uses for cellular networks. At this week's Mobile World Congress in Barcelona, Japan's NTT DoCoMo is demonstrating one such use: remote control of robots via a wireless virtual reality system. In one corner of the company's booth was a simulated factory floor with three robots. The area was surrounded by four depth-sensing 3D cameras that together provide enough video for an immersive, all-around virtual reality image. That 3D video, totaling roughly 700Mbps of data, was sent across a 5G radio link to a receiver where it was processed and fed to a VR headset. The radio link was running across a few meters on the crowded expo floor but it was hitting a top speed of around 15Gbps -- that's many times faster than is possible with the fastest of today's 4G networks. A pair of Ericsson 5G radio antennas used in a demonstration by NTT DoCoMo at Mobile World Congress in Barcelona on February 27, 2017. If virtual reality control of robots seems like a far-fetched use dreamed up by a cellular operator, consider that Japan is currently wrestling with the decommissioning of the Fukushima Daiichi nuclear power plant. Radiation levels inside the three reactors that suffered meltdowns are so high that only robots can enter, but the work is slow because engineers are still trying to figure out the exact conditions inside and need to carefully control robots around debris. A wireless VR system could possibly help in such situations. 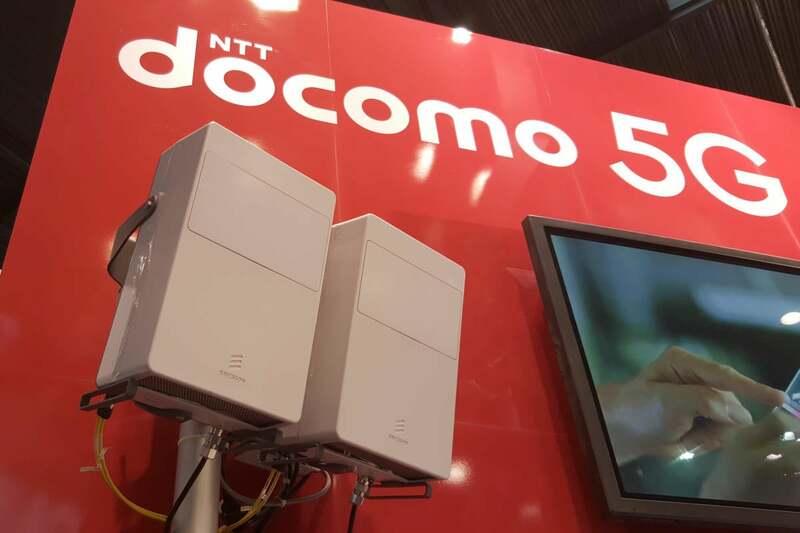 The demo at Mobile World Congress used Ericsson 5G gear and NTT DoCoMo is carrying out real-world tests in Japan with the same equipment and that from other companies. 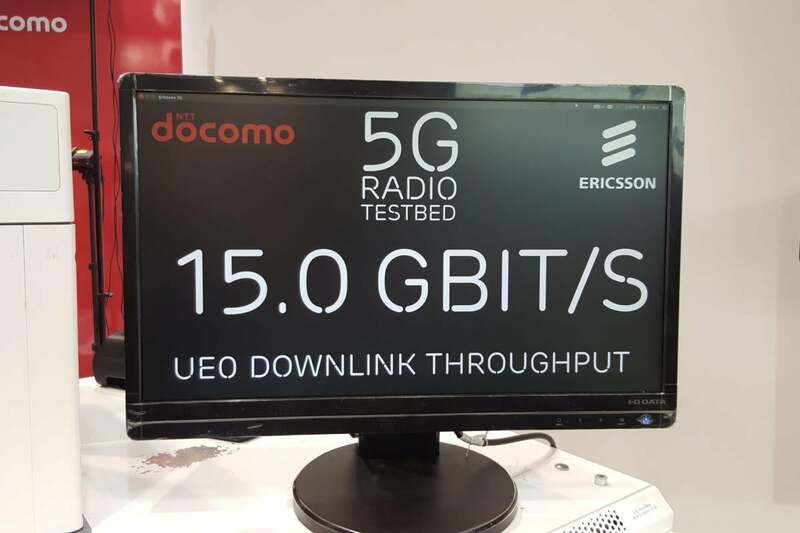 A screen shows the data rate achieved during a 5G demonstration by NTT DoCoMo at Mobile World Congress in Barcelona on February 27, 2017. In one test with Samsung, the companies managed to send a 2.6Gbps 5G signal to a car on the Fuji Speedway traveling at 150kmph. That test used a special antenna that can direct the wireless signal towards the car. In Yokohama, near Tokyo, the company has been conducting tests with Huawei that involving serving 5G data to 23 simultaneous users with a total bandwidth of 10Gbps and a test with Nokia involved sending live 8K video, which is equivalent to 16 high-definition video streams. And a test near the company's R&D center with Fujitsu is successfully switching a 1Gbps cellular signal between base stations as a receiver moves from cell to cell. 5G technology isn't yet standardized, so it's going to take a few more years before much of the equipment becomes available. The tests are crucial steps towards development of the systems.